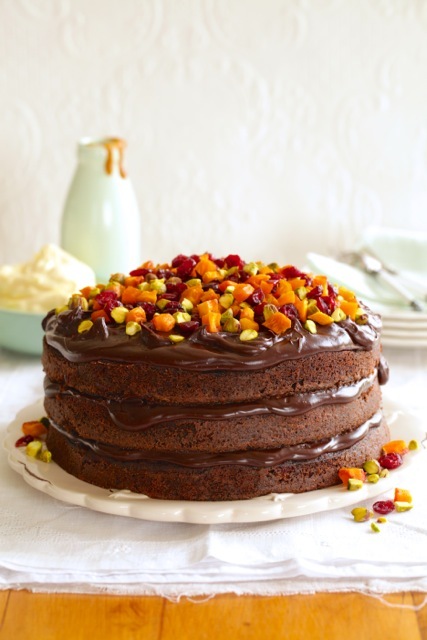 I like to use Alison’s Pantry dried fruits and nuts for this decadent cake with a healthy twist, as all these bulk bin products are of the highest quality and full of goodness. Preheat oven to 170°C. Grease and lightly dust with flour 3 x 20cm springform cake tins. Using an electric mixer, whisk eggs and sugar together until mixture is pale and doubled in volume. Add oil and whisk to combine. Stir in beetroot, cranberries, walnuts, and sifted dry ingredients. Divide mixture between prepared tins. Bake for 20 minutes or until a skewer inserted in the center of one cake comes out clean. Cool in tins for 10 minutes before removing to a wire rack to cool completely. To assemble, sandwich layers together with chocolate ganache. Spread top of cake with ganache. Scatter with dried fruits and nuts. Serve with salted caramel sauce and whipped cream on the side. Place all ingredients in a bowl set over a saucepan of gently simmering water, or microwave in short bursts, to melt. Stir until smooth and leave to cool and firm to a spreadable consistency. Place butter, sugar and cream in a saucepan and bring to the boil, stirring until butter melts and sugar dissolves. Simmer for 2-3 minutes. Remove from the heat and add salt, to taste, then leave to cool. This entry was posted on April 6, 2015 by julie.